It certainly will not go down as a classic Irish Cup encounter, but David Cushley did not care one iota come full time at The Oval. 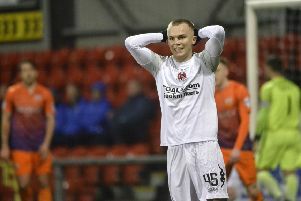 The in-form forward notched up another goal as Crusaders shot down Irish Cup holders Coleraine. Cushley admitted afterwards it has been a cagey affair, but said the Crues deserved to have progressed to meet Ballinamallard United given the run they have had to get to Windsor. “We’ve had to go about it the hard way playing Glentoran, Linfield, Ballymena and now Coleraine,” he said. “It’s Ballinamallard in the final now so hopefully we can go and do what we need to do and get the win. “Given the road we’ve had to get here I don’t think it would have mattered who we play in it. “I think we thoroughly deserve to be there and hopefully we can turn up on the day and try and win the cup. “One thing is for sure the manager won’t let us be complacent. “It was a tough game today. Coleraine came with a game plan and we had a similar plan. “The pitch was very difficult though. It’s hard to play football on. It was just a battle, which a semi final should be. “Both teams came and tried to do what they could do. “You don’t want to go behind in a semi-final, you want to keep yourself in the game. The Crues may not have been able to defend their title this season, but Cushley feels if they finish the season with European football and have the Irish Cup and County Antrim Shield in the trophy cabinet it won’t have been too bad. “We know we have shot ourselves in the foot a few times this season,” he said. Fellow goal scorer Jordan Owens admitted he was relieved to finally find the net late on after spurning two gilt edged opportunities earlier on. Owens fired home from the spot with three minutes to go after a tussle with Gareth McConaghie. “McConaghie has grabbed my hand and referees at this point you have to go down to see what you get,” he said. “I made a quick dart, I think they had switched out and he’s held me back, when you’re in the box you have to go down. “After the two chances I had maybe I needed to go down to try and create something. “Cush was off the pitch and I wanted to step up and take it after missing the two earlier chances. “Thankfully the ball went in the net. “It wasn’t a great game, the second half was a bit better, we got the chances and we took them and now we’re in the final. “I know Coleraine like to get the ball down and play a bot but you can’t on a pitch like that.